British forces personnel should always be kitted out with the most effective survival and military equipment available in order to meet the often gruelling demands of training and deployment. From specialist survival products to combat equipment and uniforms, Survival Aids has focussed on meeting these requirements and we have established ourselves as one of the leading suppliers of military clothing, equipment and footwear for those serving in the UK’s regular and reserve armed forces. As well as sending equipment all over the world to British Forces personnel wherever they may be deployed, we also supply contract equipment to many international armed forces. Survival Aids designs and manufactures uniforms and has supplied the armed forces of NATO member countries as well as supplying UK and international special forces groups. We are regularly contacted by theatre, TV and film production companies and have supplied equipment and uniforms for some very high profile films including James Bond, Pirates of the Caribbean and Mission Impossible. 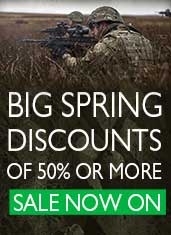 We have a wide range of products on offer that are designed to work effectively in real-world scenarios, ensuring you can operate at the highest levels during military or survival activities With such a diverse range of equipment suited to all kinds of military and survival needs, you are guaranteed to find what it is you’re looking for. From genuine survival and military clothing to navigation tools, lighting, combat accessories, outdoor cooking, shelter, survival tools and even ceremonial products, we have everything you need to complete your military equipment collection. Our products are well known for being extremely high quality to provide for even the most experienced of military survival experts. We work closely with our manufacturers to ensure the products we provide to military personnel both in the UK and abroad are capable of maximising your potential in the field. Our wide range of military clothing, from thermal vests, camouflage t-shirts and combat shirts to windproofs, snugpak jackets and fashion shirts, is suited to all kinds of activities. Our military clothing range comes in a wide selection of colours and styles to suit your particular preferences, whilst we also have uniform fabrics available for customisation purposes. We supply shelter and sleeping equipment suited to professional survival activities, including multi-terrain shelters designed to offer camouflage and efficiency in all kinds of environmental surroundings. We provide both one and two man tents, along with reliable tent pegs, survival blankets, bivi bags, bungees, cords and tapes so that your camp is always fully prepared. With such a wide range of products available here at Survival Aids, we make the most of our essential knowledge and expertise regarding both military and survival clothing and equipment to provide weekly featured products that you can confidently invest in. Whether it’s a helpful navigation tool, a handy combat accessory or something to enhance your survival techniques, we will offer you weekly recommendations from the stock we have available. We also provide discounted offers to those who are seeking a handy bargain in our clearance zone, so check back to see the high quality products that are going for a cut price every now and then. For more information, visit the Contact Us page and we’ll provide you with all the information you need regarding our services here at Survival Aids. The Ministry of Defence have revealed a new selection of British Army ration menus specially targeted to the tastes of younger soldiers and new recuits. This announcement came amid concerns that tried and tested recipes such as beef stew and lamb casserole don't appeal to a new generation of young soldiers more used to eating takeaway rather than traditional family favourites. The UK MoD is understood to be working with a number of large food companies with an intention to launch eight all new boil-in-the-bag meals by Nov 2019. The initial phase includes a 'burger with ketchup 300g', plus a 'doner kebab with spicy chilli sauce'. It is expected that a 'chicken burger', 'pizza margarita' and 'piri piri chicken and chips' menu will shortly join the range. New army ration designed to meet the tastes of younger soldiers An MOD spokesman stated '...younger people have been brought up with a different range of food to those of previous generations and it is important that we create field rations that cater to their newer tastes...' Survival Aids has managed to obtain a stock of the burger with ketchup 300g and doner kebab army ration with chilli sauce' boil-in-the-bag ration and these will be available to purchase on the website from Monday 01 April 2019. The new army rations includes a lamb doner kebab with chilli sauce These new generation military rations do not require hydration and come in the familiar retort foil pouch. The meals are easy to store and carry and can be heated by immersing in boiling water for seven to eight minutes. The meals can be eaten cold, making them to use operationally and as emergency rations. We recently field tested two of the new products and you can watch our video below: [embed]https://youtu.be/79rSxhRVLug[/embed] See our video review of two of the new British Army rations The burger is supplied with tomato ketchup in a sachet plus a sealed cheese slice. The doner kebab comes with spicy chilli sauce. Wayfayrer are one of the recognised supplier of main meal rations to the Ministry of Defence and their range is available on the Survival Aids website. Test your military skills | How observant are you? Click on the image below. To zoom in closer click a second time or for a smart phone or tablet simply enlarge your screen for greater magnification. When you've successfully located the hidden sniper, just email the grid ref to competitions@survivalaids.com. All successful entries will be entered into our competition prize draw and a winner will be selected at random to receive a Viper Tactical MTP Concealment Vest with stuff sack pictured below: The competition will close on the 15th July 2018. The winner will then be announced and their name will be published. Best of luck! What's new in camouflage and concealment?